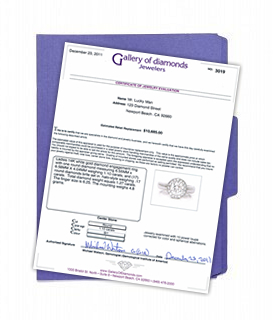 Jewelry appraisals in duplicate are provided free by our GIA gemologist Diamond Mike Watson for all diamond purchases. We provide the quality and carat weight of diamonds, the weight and description of the metal, a color photograph, and the replacement cost. On center diamonds, information is provided in accordance with the Gemological Institute of America and is accepted by every major insurance company. We recommend that you insure your jewelry against theft, total loss, center stone loss, breaking or chipping, as these are factors that no jeweler can control. • Inspect and clean: Always complimentary. • 24-hour appraisals: $125.00 per item. • 24-hour appraisal updates (appraisals we have done previously): $65.00 per item.